The budget passed last night with a tax increase of about 7%. The millage rate is down slightly but values are up so the village will bring in about 7% more. Most of that money is going to increased salaries, 3 new police positions and some new equipment for police activities. The increased spending is modest and there was nothing radically new in the budget. However, the commission, all four of them, finally agreed to put money in the budget for a dog fence. $10,000. It's not a dog park and it's not even clear where the fence will be deployed. 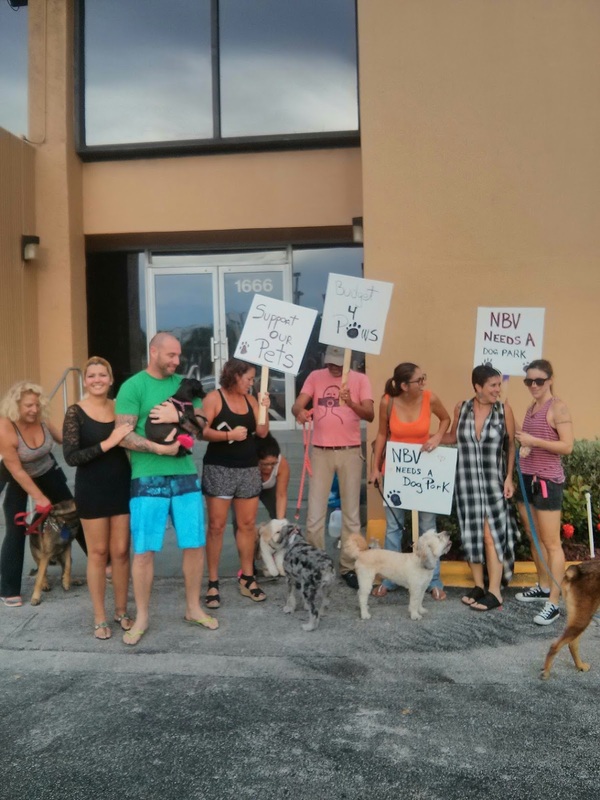 But for the first time, North Bay Village is allocating money for the estimated 1300 households that have dogs and that's not nothing. Doris O'Hare and Maxine Tayar organized a rally out front, attended by about 30 people to create visibility. Two of the commissioners, Eddie Lim and Richard Chervony took the time to discuss the issue with the residents. The mayor saw the group and ducked in the back door while Vice Mayor Jorge Gonzalez, who last year told the Herald that he owns a dog but now says he doesn't since he got elected did speak with the residents but only to berate them until he saw the real press was there. 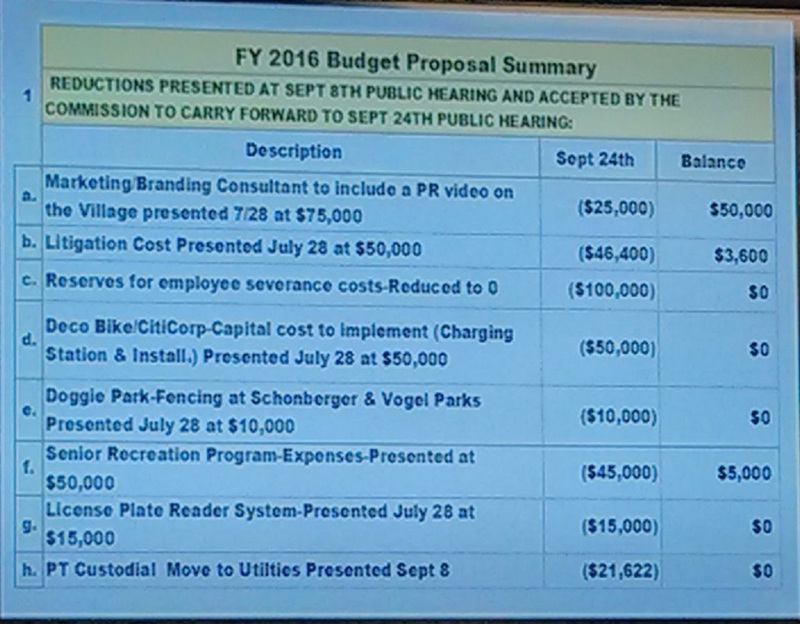 The items above are the cuts proposed between Sept 14 and the final meeting. While the marketing video continues at $50,000, most other items were cut. Note Item E, the dog fence, was cut. It was after residents demanded that it was restored and then only after the Mayor and Vice Mayor spent a good half hour talking about how they really want a dog park but there's no money and there's no space and maybe the county won't like it and maybe it should just come from reserves that they became congnizant of the fact that the real media were present, The Herald and WSVN, and so decided that they could yeah support it. The rest of the budget hearing was a mess. Mayor Kreps' sharp deterioration continued unabated as she decided to read aloud the various village employees' salaries (most quite modest) and wondered how they were set. The HR Director reminded her that pay grades were set by Mayor Kreps and the other commissioners in 2012. This did not deter or even slow down the mayor. Mrs. Kreps has become so unhinged that she no longer even chairs the meetings. She just introduces the agenda, gets it wrong and last night again, Jorge Gonzalez just grabbed the gavel and took over because someone had to now that Rootin' Tootin' Frank Rollason has fallen out with the mayor . Last night, Gonzalez was particularly fierce with the Mayor. At about 7:20, he interrupted her tirade on employee salaries to state "Madam Mayor, we are here to practice good governance, not good politics." and gaveled the meeting to move along. Still Mayor Kreps continued her rant, at 7:39 PM pointing at the manager and shrieking "THE PROBLEM IS HIM." There was one cut that never should have been made. Eddie Lim asked for a modest amount of money to promote a "3 Island Paddleboard" festival. And the commission said no, just no. While we spend $50,000 to hire a consultant to make a video promoting the city, we are too short sighted to see that we have to have things to promote. This Paddle Board idea is a perfect confluence of showcasing our location on the bay, unusual enough to attract attention and cool enough to attract new people. But it was squashed. Lim is not ready to give up. Lim sees the media possibilities and the social buzz around this event as worth 5 times what the village might contribute, and he's right. And for whatever record there may be, I am not likely to take up paddleboarding. I'm Irish. We burst into flames under that kind of sun and I am very bad at most sports. But I'd be out there cheering them on.